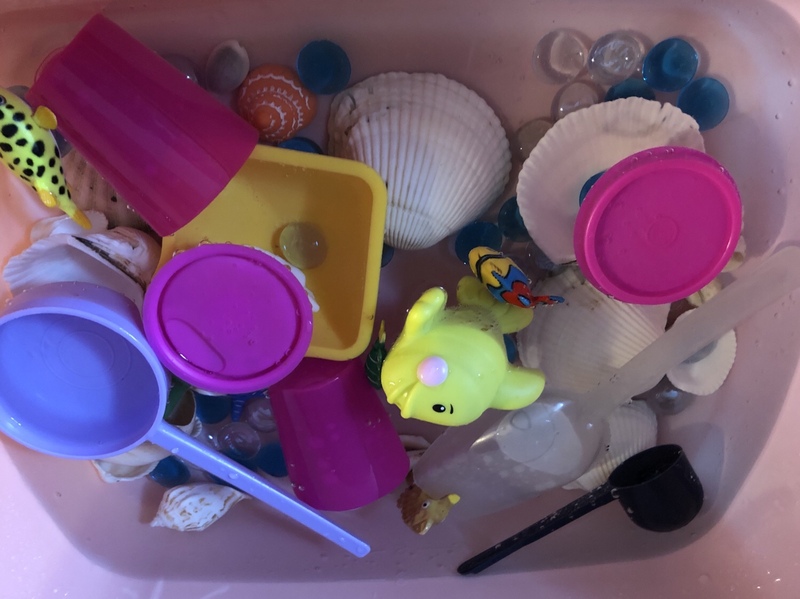 Here’s a simple sensory tub that we’ve been using a lot this summer. I know I’m very late posting this, but there is still plenty of sunshine outside and if you are not ready for fall, then this is for you. It started off as an ocean themed sensory tub, but Rosebud decided that she was a pirate looking for treasures. I’ve used this set up with and without water. She enjoys it either way. If you are really adventurous, you could add sand for the real seashore experience. Counting marbles or sorting them by color if you use multiple colors. Those were the treasures in our case. Work on fine motor skills with scooping and pouring. Watch your child using their imagination and see what they come up with.